SUGAR, flour, milk powder and bread account for half the calories consumed by people in remote Aboriginal communities, a groundbreaking study reveals. Fruit accounts for only 1 per cent of energy consumption, and vegetables - including potatoes and hot chips - just 5 per cent in one community in north-east Arnhem Land. 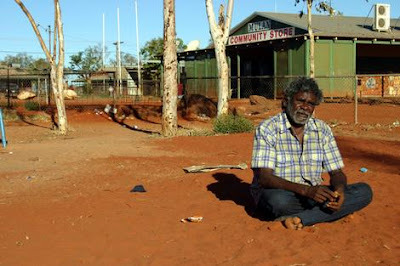 It is the first study to investigate the link between poverty and inadequate nutrition among Aborigines in the Northern Territory. While it focused on the one unnamed community of 2000 people, it offers a damning insight into a broader crisis in the nutrition of indigenous Australians. It found that fruit and vegetable consumption was a third that of the wider Australian community. Cheap but poor-quality food heavy in carbohydrates made up two-thirds of the diet. This put adults at risk of obesity-linked diseases such as cancer, diabetes and heart attack and compromised children's development, said the study leader, Julie Brimblecombe. Residents were consuming three times the recommended quantity of salt - a major cause of high blood pressure. The unhealthiest foods were the cheapest, with sugar about 30 cents for 1000 kilojoules versus nearly $10 for broccoli - a result of the high cost of transporting fresh food to remote areas. Dr Brimblecombe, who presented the results to the Australian Indigenous Women's Health Meeting in Darwin, organised by the Royal Australian and New Zealand College of Obstetricians and Gynaecologists, said previous research had emphasised the quality of the food supply but had not "looked at how people's socioeconomic circumstances affect food choices. They call [flour and sugar] 'long life' foods - foods that are filling them up and keeping them going … When you've got only a bit of money to spend on food and you don't want your children to go hungry, you don't worry so much about the quality." The study - based on a questionnaire completed by two-thirds of families and analysis of the food available in the local shop, takeaways and school - excluded healthier traditional foods, an important part of the local diet. But preliminary analysis indicated that a diet that met government nutrition recommendations was not affordable on the budget available, Dr Brimblecombe said. Short-term measures - such as distribution of fruit and vegetable hampers - were needed to address the immediate problem. But structural change was also necessary because people did not want to depend on handouts. With both major parties supporting the NT Intervention those voters who opposed the Intervention and recognised the many negative features and problems associated with the Intervention were forced to seek some other way of expressing their wrath at both the party political megoliths – Labor and the LCP -- the Tweedledum and Tweedledee who by their actions oppose Aboriginal human rights in the Territory. To have their voices heard Aboriginal voters and others opposed to the Intervention were forced shout their opposition in silence. They did so by not voting. Throughout the whole of the Territory the average voter turnout of was only two-thirds of those enrolled. Where dissidents did vote, they voted whenever possible for the only political party that had openly supported them in their struggle to stop the intervention – the Greens. In the electorate of Braitling the Greens polled 3.5% higher than the ALP , and polling booths in Greatorex also showed the vote for the Greens was higher than that for Labor. Both of these electorates cover Aboriginal Town Camps in Alice Springs. Commentators on the landslide swing against Labor in the Federal Elections have ignored such critical issues as: low turnout at the polls; the high level of informal votes; the dramatic rise in votes attained by the Greens; and swings of up to 18% against Labor in some electorates. This shows the need for the ALP to drop their support for the NT intervention. Events are being organised around the country to continue the campaign against the Intervention, particularly on September 27, when a national day of action has been called. The Australian Greens' spokeswoman for Indigenous issues says the party will be amending and re-introducing a Stolen Generations compensation bill to the Senate before the end of the year.